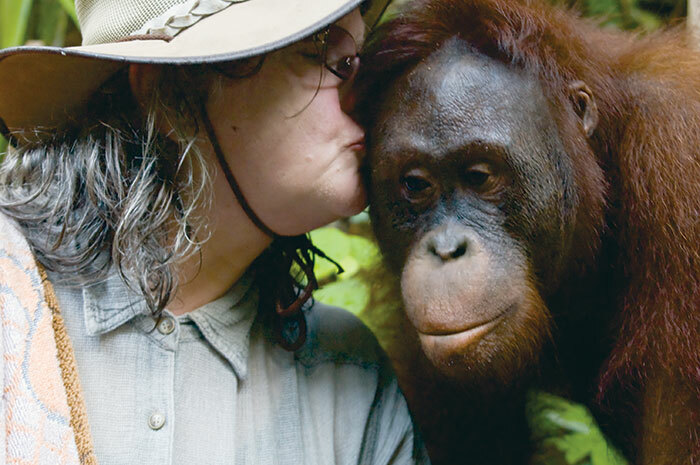 Jane Gray Morrison/ Dancing Star Foundation Dr. Gladikas and an orphaned orangutan in Tanjung Puting National Park. Dr. Biruté Mary Galdikas, the Canadian primatologist and Simon Fraser University professor, sits on the porch of her modest wooden house near the Sekonyer River in Indonesia, leaning back to back with the gentle, long-faced female orangutan she rescued from captivity nearly four decades ago. “Who would ever have guessed we would be sitting here together so many years later, eh, Akmad? ” she says to the ape, her soft speech as slow and deliberate as the movements of the five orangutans lounging and snacking around her. The world’s leading expert on orangutans, as well as the researcher behind the world’s longest continuous study of a wild mammal, Galdikas is an outspoken advocate for these primates and their habitat. At times, though, she has acted more like an overbearing mother to them. As with her fellow ape researchers Jane Goodall and Dian Fossey, her obsessively close relationship with her subjects has made her a controversial figure, both in her adopted country and in the scientific community abroad. She and her then husband, Rod Brindamour, arrived in the Borneo jungle two years later and found a rotting, bark-walled hut, as she recalls in her lyrical memoir, Reflections of Eden. Headhunting was still part of the local Dayak community’s collective memory. She spent days wading up to her armpits in tropical peat swamps, searching the canopy for any sign of orangutans. Eventually, she managed to disprove the widely held belief that orangutans were solitary creatures, by documenting their aloof but intricate relationships with one another. Google “worst mother in America,” and the name Lenore Skenazy will be among the top hits. The New York writer earned the inglorious title after she left her nine-year-old son, Izzy, alone in a department store and told him to find his way home (he had begged her for the opportunity). Armed with a MetroCard, a $20 bill, and a handful of quarters, he navigated busy intersections and labyrinthine subways, returning home no worse for wear. When Skenazy told the tale to her readers in the New York Sun, the story went viral, and helicopter parents across the country rallied against her, calling her actions cavalier and abusive. Days later, she began appearing on talk shows and in newspapers, plugging her new blog and, eventually, a book about her self-proclaimed “free-range” parenting movement. Galdikas had always hoped her adopted apes would return to the forest, but like the helicopter parents of her generation she was initially afraid to let go. She didn’t think her nine-year-old adolescent was ready to fend for himself when Brindamour released Sugito into the jungle without her consent. Brindamour later returned to Canada with their three-year-old son, Binti, and Galdikas married a local Dayak farmer, Pak Bohap, and had two more children. Four years after arriving in Indonesia, she introduced the world to orangutans from the cover of National Geographic, where she was pictured, eyes downcast, hair to her waist, walking hand in hand with one orangutan and carrying another with its arms around her. The image perfectly illustrated the contradiction she was living: how could she objectively study wild orangutans while parenting ex-captives? Some practical arguments militated against her releasing her adopted charges. Many locals considered the apes status symbols and tasty meals; others saw them as pests that destroyed crops. Wildlife researchers argued that releasing former captive orangutans into the forest could threaten wild populations with disease and famine. Eventually, Galdikas gave the adopted apes their independence but offered a safety net (in the form of feedings) to those that struggled with foraging. Even this was controversial in a field that favoured a sink-or-swim approach to release. In the mid-’70s, she observed a wild female orangutan emerging from her night nest without her infant daughter. Galdikas looked on helplessly as the animal and her older son became increasingly ill and eventually disappeared, and she surmised that they had died of malnutrition. She blamed the deaths on loss of habitat—huge portions of previously untouched lowland jungle have been destroyed for palm oil plantations or illegally logged—and she began to view the spirit of scientific study by a detached observer as a farce. The fate of wild orangutans had already been irreversibly altered by humans. In 1982, she successfully lobbied the Indonesian government to expand the Tanjung Puting reserve and make it a national park. With the support of the local police, she initiated patrols to crack down on illegal loggers, miners, and poachers, and she compelled officials to confiscate captive orangutans. Her charity, Orangutan Foundation International, raises half a million dollars annually, and it has purchased forest that would otherwise be subject to logging or palm oil concessions. Galdikas currently houses more than 330 orangutans at a nearby centre, releasing them by day into an eighty-hectare swath of forest and caging them at night. Akmad and her counterparts now live in the wild but visit Camp Leakey as they please, disappearing for months on end and then suddenly reappearing for a meal. On this humid tropical afternoon at Camp Leakey, Galdikas pauses to offer a handful of rambutan to Percy, a playful juvenile male who hangs by one arm off a nearby tree. Galdikas is sixty-five years old now, but she and her 170 employees continue her research and conservation work. She is full of plans for the future. The monotonous drone of cicadas quiets as the surrounding jungle darkens at dusk, and the conversation takes a morbid turn. The end of life is so much closer here in Indonesia, says Galdikas. She has come to accept that, for both orangutan and human, death can come at any time.